Abstract: This essay examines two artists at the vanguard of the artistic revolution of Quattrocento Florence, revered both by their contemporary artists and by our retrospective gaze: Lorenzo Ghiberti and Donatello. 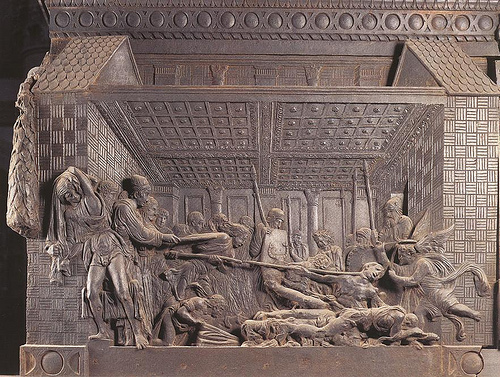 Ghiberti’s Gates of Paradise and Donatello’s San Lorenzo pulpits are two sets of sculptural reliefs created at the end of the artists’ careers. They exemplify the active struggle and innovation of early Renaissance artists in their rendering of narratives and pictorial spaces. A comparison between these two capolavori can improve our understanding of how sculptural relief and Quattrocento art in general balanced these elements of representation. Ghiberti’s compositions, on the one hand, represent formal harmony and aesthetic unity, while Donatello’s represent narrative and expressive strength. Ghiberti subjugates narrative to aesthetic effect while Donatello subjugates compositional harmony to expressive effect. Introduction: In the spiritual epicenter of Quattrocento1 Florence April 2, 1452 marked the completion of the Baptistery of San Giovanni’s third set of bronze doors. The soon-thereafter-dubbed “Gates of Paradise” are essentially Lorenzo Ghiberti’s final work. Together with the North Doors of the same Baptistery completed several decades earlier, these East Doors comprise most of Ghiberti’s life work. Fourteen years later, in 1466, Donatello died, leaving as his final work his own set of bronze reliefs. These reliefs were not a gilded announcement of Florentine civic accomplishment, visible 24 hours a day by all passersby. They were not over twenty years in the making, nor did they inspire lasting superlatives from Michelangelo. But, like Ghiberti’s doors, the San Lorenzo pulpits challenge the representative and expressive potential not only of sculptural relief but of pictorial representation. In a time in which the modern conception of the artist was only germinating, craftsmen, architects, painters, and sculptures lacked the clear separations between media of contemporary associations. Artists were simultaneously architects and builders; Ghiberti began as a goldsmith. In this fluidity of media sculptural relief lay at an interesting— and prestigious—intersection between the three-dimensionality of sculpture and the two-dimensionality of painting.